You must eat everything you find. It is an impulse you must have, an instinct that kicks in whenever anything edible (and most things are edible) is detected by your nose, eyes, or ears. Devour the target sustenance before anyone else can have the chance to take it. It must be consumed as soon as possible, without fail. For better or worse, this is the relationship you must have with food in the forest. It is not an idea I have always believed. There was a time when I figured that all edible things were for anyone who needed to eat. I did not have any more right to the garbage can I found several cheese encrusted napkins in than any other living and willing creature in the forest. I have, a great many times, shared my findings with raccoons exploring the same dumpsters that I explore (though they usually do not seem to appreciate it). I have even left bits of food behind after I have had my share. There have been many clusters of berries that I have left only half picked so that other forest dwellers can get their fill. I tried to stop this attitude the day I realized that other forest dwellers did not extend the same courtesy to me. Some time ago, during a cold, windy time of the year, I was having an incredibly difficult time finding food. Many berry bushels were stripped or dead. The river’s fish were gone (I assume because swimming in ice is very difficult). Even the bugs I sometimes snacked on seemed absent, making the forest feel barren and lifeless. I decided to check with the best source of food there is when the forest is having trouble providing: trash cans. There are several garbage cans and dumpsters I frequent. I have to travel quite far to get them, to places where the trees turn into human caves and the dirt turns into massive, flat rocks. Once you have the scent of one of these receptacles, however, they can be easy to find. I checked my regular spots. For some reason, on this particular day, they would not open. I scratched and pawed at every trash can I visited, and it was impossible to get the lid off of each one. Some little metal object was keeping the trash cans tightly shut. 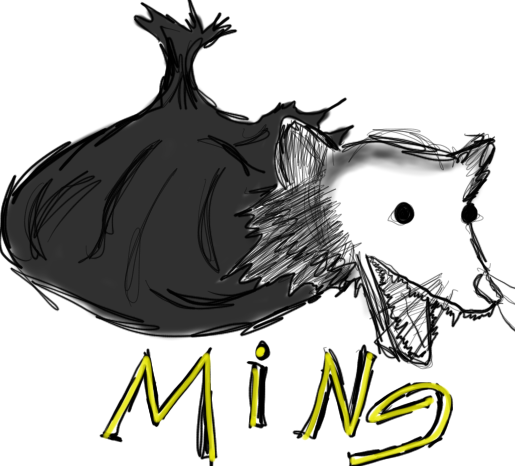 When I got to my last trash can, there was a opossum waiting underneath some plastic bags near it. This trash can, like the others, was locked tight. I tried to ask the opossum if it knew of any open trash cans, but my questions were met with wild hissing. As I turned from the trash can to head back to my cave, I heard a creaking sound. I looked back to see what it was, and before my head could turn all the way around, I saw a black, full bag smack the ground followed by a loud slam where the creaking sound had been. I could smell the bag. There was something warm and delicious inside. The opossum quickly approached it. The tiny creature ripped through the plastic and buried its pointy face into the bag’s treasures. I was patient. I watched, relying on the generosity of my fellow forest dwellers. Surely this opossum would leave me a shred of what was inside that bag. As I watched, waiting and trying to stop myself from lunging toward the bag, the opossum made a loud, horrible shrieking sound. I have no idea where they were hiding, but a small herd of pointy faced shriekers bombarded the plastic bag. The plastic was being stretched and clawed through. I could see the cluster of creatures climbing over one another as they chomped down whatever sustenance the bag had for them, their tiny toes and tails wiggling around, making it appear from the outside of the bag as though a million worms were inside. Despite the grotesque imagery of the opossum feeding frenzy, my appetite did note wane, Naively, I waited still. I told myself that no creature could be so selfish and greedy as to take everything themselves and leave nothing for everyone else. In an instant, they vanished. I approached what tattered remains were left of the bag. There was nothing. Not even the slightest morsel of food could be gathered. I was enraged. I howled and growled at nothing. I ran toward where the creaking and slamming had happened, the origin of the plastic bag, and began clawing at the square shaped piece of wood that was there. Splinters caught my paw, and, in confused anger, I began to run around the plastic bag’s remains, still growling and howling, now in pain as much as rage. The wooden square creaked open again. A human stared at me. I ran, frightened and angry. I was ashamed of myself, so I trudged back to my cave and licked some moss I found in a dark corner of my cave. I was ashamed of myself. I was ashamed for blaming the wooden square for my troubles (how could it have known opossums were so ravenous and self-centered?). I was ashamed for not helping myself to the plastic bag’s spoils. I was ashamed for assuming all creatures in the forest were invested in my best interests. That was a very cold, long night. Since then, I have been weary to let any fraction of the food I find to go untouched. I hunt and gather all nourishment and keep it and hoard it and never let a single soul outside myself know of its deliciousness. Or, at the very least, I try to convince myself to do so. In practice, I still hold onto my old ways. I still leave behind pieces of food I find for other hungry forest inhabitants. I tell myself I should not. I tell myself that every creature is like those opossums. They will take everything right in front of you, but I am rarely actually able to stick to this philosophy. I do not think every creature is like those opossums. My instinct is not to take everything I want. My instinct is try my best to live in a complex ecosystem that will not always be friendly to me. This entry was posted in Bear thoughts and tagged @a_single_bear, bear blogs, bears, food, foodie, humor, nature, thoughts, trash cans on August 10, 2015 by A bear. Oh, bear. I love you.